1. Place the fruit sugar, caster sugar, rhubarb, grenadine, liqueur and the seeds of the vanilla pod into a bowl and cover with clingfilm. Put the bowl over a pan of simmering water, allow to stand for 1 hour. Remove the bowl, strain through a fine sieve and place both the reserved rhubarb syrup and the compote in separate bowls in an iced water bath. 2. 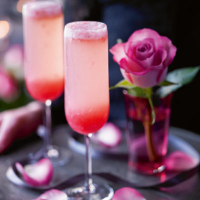 Place 1½ tbsp of rhubarb compote with some of the reserved syrup into 2 chilled Champagne flutes, and fill to the top with chilled Champagne. This recipe was first published in Fri Jan 31 14:42:00 GMT 2014.